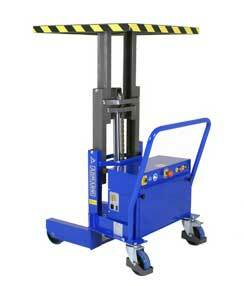 GAMMA 800 12V LIFTING PLATFORM. The GAMMA 800 12v is an all purpose electric lifting table which is powered by a 12v electric battery. It has a 800kg maximum capacity and a maximum lifting height of up to 1,475mm, it is the ideal equipment for the service to machine tools and operators. Motor-driven lifting through electro-hydraulic control unit fed by battery; thanks to the built-in battery charger, it is also possible to recharge it directly where it is being used. Finally, with the comfortable push handle, it is possible to manually move the load in a safe and accurate way. Thanks to the lifting system with piston in vertical position, without pantograph structure, it is possible to contain the dimensions; GAMMA 800 thus becomes the ideal tool as work table for the operator or service to the machine tools.